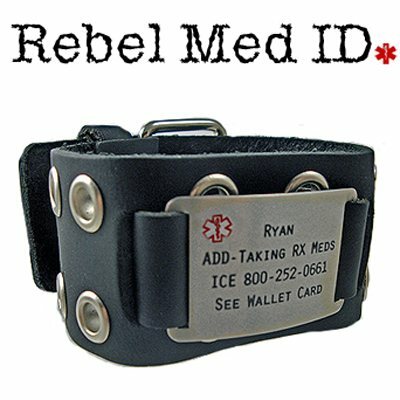 Let your spirit for your own individuality soar with our New "Rebel Med ID" Series Medical bands ~ Our UNISEX Rugged Eyelet leather band in Black. Genuine leather is made in the USA. The band is has 16 total metal eyelets and comes with a stainless steel medical tag that easily snaps in, buckle closure. Medical information engraved on the front. *Note: Leather is a natural material and is therefore signs of wear are normal. Irregularities in the consistency and depth of the color in each band should not be considered a defect but inherent of the natural beauty of leather. There are no further discounts on this laser engraved product. If wrist/arm size is not listed on drop down menu below it will not fit. Re-sizing Not available.